With the stimulus package [Porkulus] in the rearview mirror, attention on Capitol Hill is beginning to turn to the next round of spending issues, which will encompass an omnibus [i.e, Porkubus not to be confused with the Porkulus] spending bill and President Obama’s first budget. As the omnibus begins to make its way through Congress, the Obama administration will unveil its budget for fiscal year 2010. According to The New York Times, the budget will show a staggering $2.7 trillion in red ink over the next decade. For comparison, according to the Bush White House’s 2009 budget, all federal spending in 2007 amounted to around $2.7 trillion. This year alone, the deficit is expected to reach at least $1.5 trillion. With this mountain of debt staring Americans in the face, it almost seems ridiculous to see Politico’s report that House Speaker Nancy Pelosi is now asking her committee chairmen to “scrutinize our budget, promote efficiency and reduce waste in government spending.” After passing an unprecedented $787 billion bill stuffed with dubious spending projects, it’s hard to believe that Democrats seriously want to address the budget deficit, though it would be a pleasant surprise if they do. We’re looking at $1.1 trillion in spending, at least, and it’s not even March yet. There are still ten and a half months left in the year. 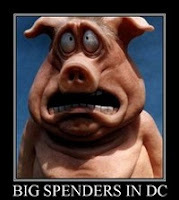 How much more are Democrats going to want to spend before Congress adjourns? Tags: bill, Congressional Pork, federal spending, omnibus bill, US Congress, US House, US Senate, Washington, D.C. To share or post to your site, click on "Post Link". Please mention / link to the ARRA News Service. Thanks!